ww2dbaseSaburo Sakai was born in Saga, Japan into a family of samurai ancestry but made a living as farmers. Sakai's father passed away when he was 11. He joined the Japanese Navy on 31 May 1933 when he was 16. Upon graduation, he served as a turret gunner aboard battleship Kirishima. 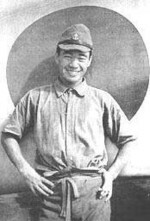 In 1936, he left Kirishima to join the pilot training program. He graduated first in has class in 1937 as a carrier pilot (although he never received carrier duty) and was presented a silver watch by Emperor Showa. ww2dbaseDuring WW2, in 1938, Sakai was assigned to China flying an A5M Navy Type 96 fighter, and was slightly wounded in the following year. In Oct 1939, he shot down a Russian-built DB-3 bomber over China. In 1940, he was among those chosen to fly the new A6M Zero fighters in field tests in combat against Chinese forces. On 8 Dec 1941, as a member of Tainan Air Group based in Taiwan, he flew one of the 45 A6M Zero fighters from his unit against Clark Airfield in the Philippine Islands, downing a P-40 Warhawk fighter during that mission. 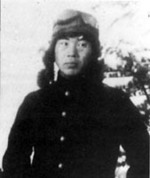 On 9 Dec, he was sent to attack American targets again during bad weather. On 10 Dec, he shot down the B-17 Flying Fortress piloted by Captain Colin P. Kelly, the first B-17 to be lost in the war. In early 1942, he was transferred to Tarakan Island in Borneo and fought in the Dutch East Indies. Initially ordered to down all Allied aircraft regardless of military or civilian, but at one incidence, he allowed a Dutch DC-3 passenger liner to go unharmed after he spotted a blond woman with a child through one of the passenger windows. Between late Jan and Apr 1942, he was grounded due to illness. ww2dbaseAt the rank of petty officer first class, Sakai re-joined the Tainan Air Group in Apr 1942, now based at Lae, New Guinea. On 17 May, together with fellow aces Hiroyoshi Nishizawa and Toshio Ohta, the three young pilots pulled a stunt of performing aerial acrobatics over an Allied airfield; the performance was done without any anti-aircraft fire, but they were later scolded by commanding officer Lieutenant (jg) Junichi Sasai. His tenure in New Guinea saw the most of his kills during the Pacific War. His unit was relocated to Rabaul in New Britain, Solomon Islands on 3 Aug, just days before the Americans launched the Guadalcanal campaign. The Tainan Air Group attacked Henderson Field almost daily, and Sakai saw many engagements there. On 8 Aug 1942, he scored a killed against a F4F Wildcat fighter flown by James "Pug" Southerland over Guadalcanal, Solomon Islands. After an extended dogfight where no one seemingly had a clear upper hand over, Sakai was able to hit Southerland's fighter underneath the left wing root, downing it. As he engaged SBD-3 Dauntless dive bombers from carrier Enterprise over Guadalcanal, however, he was not successful. He fired 232 rounds at one, scoring several hits but unable to disable the heavily-armored aircraft, he was hit by shots from the rear machine gun (manned by Harold L. Jones), blowing away his canopy and hitting him once in a head. Blinded in one eye by blood, he flew upside down periodically to prevent blood from blinding his other eye. "If I must die, at least I could go out as a Samurai. My death would take several of the enemy with me", he initially thought, as he felt the left side of his body paralyzed after his head wound. After a brief moment, he abandoned that idea as he realized his aircraft was in flyable condition, and he was able to control it despite his partial paralysis. he returned to Rabaul after a nearly 5-hour flight without his cockpit canopy. He insisted on making his debriefing report after landing, and collapsed immediately afterwards. His squadron mate Hiroyoshi Nishizawa drove him to the unit surgeon, who was able to stabilize his condition. He was evacuated to Yokosuka, Japan on 12 Aug where he endured a long surgery without anesthesia, repairing most of the damage to his head, but his right eye would never recover fully. He was out of commission for five months. ww2dbaseUpon recovery, Sakai trained new fighter pilots. In Apr 1944, he was able to convince his superiors to let him fly again despite the poor vision in his right eye. He was deployed to Iwo Jima, Japan with the Yokosuka Air Wing. On 24 Jun, he mis-identified a group of 15 F6F Hellcat fighters as friendly and flew too close, and was attacked; he was able to shake off 20 minutes worth of attacks from these fighters and returned to base unscathed. On 5 Jul 1944, he was ordered to lead a kamikaze special attack mission, but returned to base after failing to locate the reported American task force. In Aug 1944, he was promoted to the rank of ensign, 11 years after his enlistment. In Aug 1945, just before the war ended, he was promoted to the rank of lieutenant (jg). ww2dbaseDuring the course of WW2, Sakai destroyed an estimated 64 enemy aircraft, most of which were American. ww2dbaseAfter the war, Sakai retired from the Japanese Navy at the rank of lieutenant. He became a devout Buddhist who refused to kill another living thing. He eventually started a printing shop to make a living, and hired family, friends, and fellow veterans who otherwise could not find work. He lost his first wife in 1954, and he later remarried. He visited the United States and met some of his former adversaries, including Harold L. Jones, the rear gunner who nearly killed him over Guadalcanal. In 2000, he worked briefly for Microsoft as a consultant to the game Combat Flight Simulator 2. In his later years, he was a motivational speaker for Japanese schools and businesses; his theme was always "never give up". In his final years, he attracted much attention for his criticism for Japan's inability to accept responsibility for starting the wars in Asia and the Pacific. "Who gave the orders for that stupid war? ", he said in an article reported 10 Aug 2000 by the Associated Press. "The closer you get to the emperor, the fuzzier everything gets." Sakai told reporters near the end of his life that he still prayed for the souls of the Chinese, American, Australian and Dutch airmen he had killed. "I pray every day for the souls of my enemies as well as my comrades," he said. "We all did our best for our respective countries." He passed away from a heart attack in 2000. 25 Aug 1916 Saburo Sakai was born in Saga, Japan. 31 May 1933 Saburo Sakai joined the Japanese Navy. 8 Dec 1941 Saburo Sakai of Japanese Navy Tainan Air Group, flying an A6M Zero fighter, attacked Clark Field in the Philippine Islands; he shot down one P-40 Warhawk fighter. 9 Dec 1941 Saburo Sakai, flying an A6M Zero fighter, attacked US positions in the Philippine Islands in poor weather. 10 Dec 1941 Saburo Sakai, flying an A6M Zero fighter, shot down a B-17 Flying Fortress bomber flown by Captain Colin Kelly in the Philippine Islands. 16 Apr 1942 Saburo Sakai and other pilots of the Japanese Navy Tainan Air Group arrived at Rabaul, New Britain via the transport ship Komaki Maru. 17 May 1942 Saburo Sakai, Hiroyoshi Nishizawa, and Toshio Ohta performed daring aerial stunts over an Allied airfield; they were later scolded by their commanding officer Lieutenant (jg) Junichi Sasai. 3 Aug 1942 Saburo Sakai, along with the others of Japanese Navy Tainan Air Group, was relocated to Rabaul, New Britain. 8 Aug 1942 Saburo Sakai, flying an A6M Zero fighter, shot down a F4F Wildcat fighter flown by James Southerland. His fighter was subsequently hit by gunner Harold Jones in a SBD-3 Dauntless dive bomber, blowing away the canopy, causing a gashing wound on his head that blinded him in one eye. He was able to fly his fighter back to Rabaul, New Britain, collapsing only after having successfully landed. 12 Aug 1942 In Yokosuka, Japan, Saburo Sakai underwent surgery for the wound sustained during combat over Guadalcanal, Solomon Islands on 8 Aug 1942. 24 Jun 1944 Saburo Sakai mis-identified a group of 15 F6F Hellcat fighters as friendly, but he was able to escape from their attacks unscathed. 5 Jul 1944 Saburo Sakai led a special attack mission against US naval units, but returned to base after failing to locate any targets. 10 Aug 2000 Saburo Sakai was interviewed by the Associated Press. 22 Sep 2000 Saburo Sakai passed away from a heart attack while being a guest at Naval Air Facility Atsugi, Japan. Saburo Sakai was a great fighter pilot, to be wounded and keep his zero in the air for over 44 hrs! loss of an eye, and return to combat! flying combat missions with one eye.